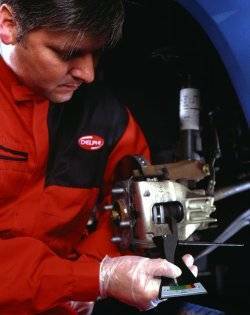 Delphi Lockheed brake products as our first choice when servicing your brakes. When was the last time you had your vehicles braking system serviced or even checked? In an independent test conducted by Delphi technicians, over 60% of the cars sampled were found to have Brake Fluid that tested below the recommended boiling point! This is a common cause of brake failure with vehicles on the road. Visit a Delphi Lockheed Brake Safety Centre today and put your vehicle in the hands of highly trained Brakes Specialists and have confidence in knowing that you are driving a safe vehicle. Remember if your Brakes are unsafe, it is not just your life that is in danger! Delphi Lockheed’s Brake Safety Centres are regularly updated with the latest product and technical information on braking systems and fitting techniques, providing you with the confidence that your car is being maintained and repaired by complete professionals using quality components that comply to E-90 Regulations. E-90 is a European Legislation, that in simple terms, requires a manufacturer to prove, via independently witnessed test procedures, that the performance of their friction products is within a tolerance of the original equipment brake pads or shoes fitted to the vehicle. Delphi Lockheed have the leading E-90 approved range of braking products in the industry. Our Premium Brake Pad Programme uses a range of friction materials all directly derived from OE (Original Equipment) materials, thus ensuring the closest match to the OE parts. By visiting and regularly using your local Brake Safety Centre you can be sure to receive a friendly, efficient and quality service, from highly trained specialists, using quality products. Visit Peter Cooper Car Repairs your local specialists today or phone on 01932 340384. We welcome new customers from the local area Cobham Byfleet West Byfleet Addlestone Chertsey Esher Weybridge Walton on Thames Ripley Woking and the surrounding area.